July 28th, 2013 | Faces of Wheaton. Sunday Spotlight is a weekly publication highlighting individual Wheaton employees, agents and drivers and the unique talents, interests and hobbies each has. Every year, the Wheaton corporate office welcomes temporary staff to help with the influx amount of work that occurs during the busy summer months. 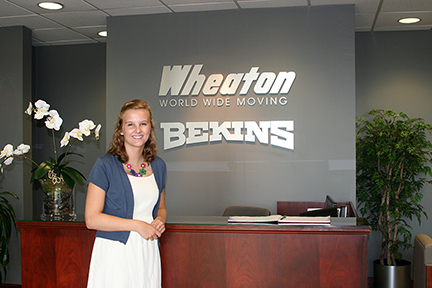 In her own words, read on to hear the perspective of working at Wheaton World Wide Moving from the Sales & Marketing’s summer help, Brittan Leonardo. I’m no expert in the moving industry. This is my first “big kid job”. Needless to say, I was pretty nervous on my first day at Wheaton World Wide Moving. I tried to console myself by remembering that I’m not completely foreign to the concept of moving. After all, I have moved five times and lived in four different states, so maybe working at the company won’t be much different? As I walked in the doors of the office, I didn’t know anyone or have any idea of what to expect. As I was led to the Sales & Marketing department, which would be my home for the next couple of weeks, the nerves only grew. 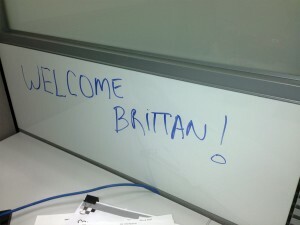 I then saw my very own cubicle where one of my co workers had written “Welcome Brittan!” on my whiteboard. I instantly relaxed and realized, just as promised, that everyone who works here is friendly and welcoming. I was immediately thrown into the thick of things and assigned several projects. One of my first projects, and one of the biggest, was updating our agent’s web listings on our company Web site. To do this, I had to go through and contact every agent that didn’t have personalized information and get them to fill out a form. There were A LOT of agents and convincing them to fill out a form during busy season is not as easy as you might think. After a few weeks of emailing, calling, and having to repeat my name a million times, responses started to roll in. After uploading the information, the Web site is slowly but surely being updated. My favorite project that I was assigned was researching all the major cities in the United States. I was responsible for locating the city’s social media sites, traveler’s information sites and researching fun facts about the city. This information was then used for the “Road Trip” series of posts on the Wheaton blog sites written by Online Content Development Specialist, Meredith Slavens. As my summer is coming to a close, my time as an employee is slowly coming to an end. I still have the “Welcome Brittan!” written on my whiteboard, as if it’s still my first day. I’m also still as busy as ever with new projects and tasks to complete. Looking back, this position has challenged me, and has also introduced me to some really great people. I can only hope that I have another summer ahead of me working at Wheaton. Brittan is currently a sophomore at Purdue University in West Lafayette, Ind. and studying Social Studies Education. Her dream job would be teaching high school students AP Government or AP US History. She is active on campus through her sorority, Phi Mu as well as Purdue’s new student orientation program, Boiler Gold Rush. In her free time, she enjoys playing the violin and doing anything outdoors.